Benedictine; born in 1240 or 1241 at the ancestral castle of Helfta, near Eisleben, Saxony; died in the monastery of Helfta, 19 November, 1298. She belonged to one of the noblest and most powerful Thuringian families, while here sister was the saintly and illustrious Abbess Gertrude von Hackeborn. Some writers have considered that Mechtilde von Hackeborn and Mechtilde von Wippra were two distinct persons, but, as the Barons of Hackeborn were also Lords of Wippra, it was customary for members of that family to take their name indifferently from either, or both of these estates. So fragile was she at birth, that the attendants, fearing she might die unbaptized, hurried her off to the priest who was just then preparing to say Mass. He was a man of great sanctity, and after baptizing the child, uttered these prophetic words: "What do you fear? This child most certainly will not die, but she will become a saintly religious in whom God will work many wonders, and she will end her days in a good old age." When she was seven years old, having been taken by her mother on a visit to her elder sister Gertrude, then a nun in the monastery of Rodardsdorf, she became so enamoured of the cloister that her pious parents yielded to her entreaties and, acknowledging the workings of grace, allowed her to enter the alumnate. Here, being highly gifted in mind as well as in body, she made remarkable progress in virtue and learning. Ten years later (1258) she followed her sister, who, now abbess, had transferred the monastery to an estate at Helfta given her by her brothers Louis and Albert. As a nun, Mechtilde was soon distinguished for her humility, her fervour, and that extreme amiability which had characterized her from childhood and which, like piety, seemed hereditary in her race. While still very young, she became a valuable helpmate to Abbess Gertrude, who entrusted to her direction the alumnate and the choir. Mechtilde was fully equipped for her task when, in 1261, God committed to her prudent care a child of five who was destined to shed lustre upon the monastery of Helfta. This was that Gertrude who in later generations became known as St. Gertrude the Great. Gifted with a beautiful voice, Mechtilde also possessed a special talent for rendering the solemn and sacred music over which she presided as domna cantrix. All her life she held this office and trained the choir with indefatigable zeal. Indeed, Divine praise was the keynote of her life as it is of her book; in this she never tired, despite her continual and severe physical sufferings, so that in Hisrevelations Christ was wont to call her His "nightingale". Richly endowed, naturally and supernaturally, ever gracious, beloved of all who came within the radius of her saintly and charming personality, there is little wonder that this cloistered virgin should strive to keep hidden her wondrous life. Souls thirsting for consolation or groping for light sought her advice; learned Dominicans consulted her on spiritual matters. At the beginning of her own mystic life it was from St. Mechtilde that St. Gertrude the Great learnt that the marvellous gifts lavished upon her were from God. 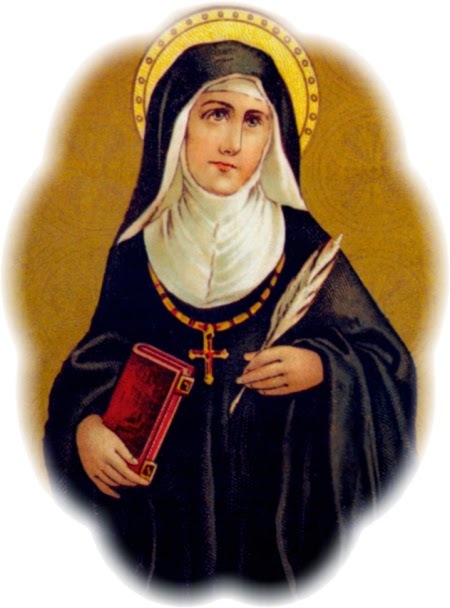 Only in her fiftieth year did St. Mechtilde learn that the two nuns in whom she had especially confided had noted down the favours granted her, and, moreover, that St. Gertrude had nearly finished a book on the subject. Much troubled at this, she, as usual, first had recourse to prayer. She had a vision of Christ holding in His hand the book of her revelations, and saying: "All this has been committed to writing by my will and inspiration; and, therefore you have no cause to be troubled about it." He also told her that, as He had been so generous towards her, she must make Him a like return, and that the diffusion of therevelations would cause many to increase in His love; moreover, He wished this book to be called "The Book of Special Grace", because it would prove such to many. When the saint understood that the book would tend to God's glory, she ceased to be troubled, and even corrected the manuscript herself. Immediately after her death it was made public, and copies were rapidly multiplied, owing chiefly to the widespread influence of the Friars Preachers. Boccaccio tells how, a few years after the death of Mechtilde, the book of her revelations was brought to Florence and popularized under the title of "La Laude di donna Matelda". It is related that the Florentines were accustomed to repeat daily before their sacred images the praises learned from St. Mechtilde's book. St. Gertrude, to whose devotedness we owe the "Liber Specialis Gratiae" exclaims: "Never has there arisen one like to her in our monastery; nor, alas! I fear, will there ever arise another such!" -- little dreaming that her own name would be inseparably linked with that of Mechtilde. With that of St. Gertrude, the body of St. Mechtilde most probably still reposes at Old Helfta thought the exact spot is unknown. Her feast is kept 26 or 27 February in different congregations and monasteries of her order, by special permission of the Holy See.There is another honour, inferior certainly to that of sanctity, yet great in itself and worthy of mention here: the homage of a transcendent genius was to be laid at the feet of St. Mechtilde. Critics have long been perplexed as to one of the characters introduced by Dante in his "Purgatorio" under the name of Matelda. After ascending seven terraces of a mountain, on each of which the process of purification is carried on, Dante, in Canto xxvii, hears a voice singing: "Venite, benedicti patris mei"; then later, in Canto xxviii, there appears to him on the opposite bank of the mysterious stream a lady, solitary, beautiful, and gracious. To her Dante addresses himself; she it is who initiates him into secrets, which it is not given to Virgil to penetrate, and it is to her that Beatrice refers Dante in the words: "Entreat Matilda that she teach thee this." Most commentators have identified Matilda with the warrior-Countess of Tuscany, the spiritual daughter and dauntless champion of St. Gregory VII, but all agree that beyond the name the two have little or nothing in common. She is no Amazon who, at Dante's prayer that she may draw nearer to let him understand her song, turns towards him "not otherwise than a virgin that droppeth her modest eyes". In more places than one the revelations granted to the mystics of Helfta seem in turn to have become the inspirations of the Florentine poet. All writers on Dante recognize his indebtedness to St. Augustine, the Pseudo-Dionysius, St. Bernard, and Richard of St. Victor. These are precisely the writers whose doctrines had been most assimilated by the mystics of Helfta, and thus they would the more appeal to the sympathies of the poet. The city of Florence was among the first to welcome St. Mechtilde's book. Now Dante, like all true poets, was a child of his age, and could not have been a stranger to a book which was so popular among his fellow-citizens. The "Purgatorio" was finished between 1314 and 1318, or 1319 --just about the time when St. Mechtilde's book was popular. This interpretation is supported by the fact that St. Mechtilde in her "Book of Special Grace" (pt. I, c. xiii) describes the place of purification under the same figure of a seven-terraced mountain. The coincidence of the simile and of the name, Matelda, can scarcely be accidental. For another among many points of resemblance between the two writers compare "Purgatorio", Canto xxxi, where Dante is drawn by Matelda through the mysterious stream with pt. II, c. ii. of the "Liber Specialis Gratiae". The serene atmosphere which seems to cling about the gracious and beautiful songstress, her virgin modesty and simple dignity, all seem to point to the recluse of Helfta rather than to the stern heroine of Canossa, whose hand was thrice bestowed in marriage. Besides, in politics Dante, as an ardent Ghibelline, supported the imperial pretensions and he would have been little inclined to sing the praises of the Tuscan Countess. The conclusion may therefore be hazarded that this "Donna Matelda" of the "Purgatorio" personifies St. Mechtilde as representing mystic theology.